I was asked to write a little about food budgeting after my series “How to Not Menu Plan” which you can read here: Part One and Part Two. 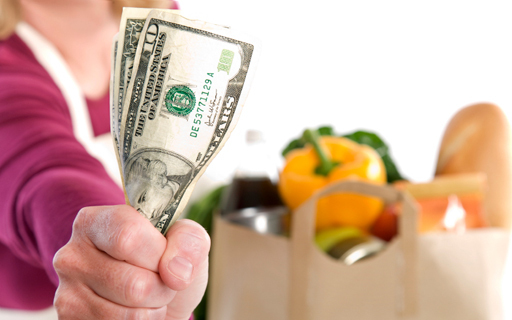 Let’s be honest, food budgeting is HARD. Actually all budgeting is hard. I definitely do not have this mastered, but I do live (survive) on a tiny budget, so I figure I have some experience with this. I don’t think I can cover all my thoughts here, so I will start with this post, and see if it later becomes a series. If you have any questions or comments, please let me know! I would love to include your thoughts in future posts. My husband and I live off of one small income. Most months I try to keep our food budget to $50/week. I often exceed this limit, but have to compensate later when we balance budgets. It doesn’t help that we like good, healthy food. I could never live off of Ramen, and sometimes we have pretty specific tastes. (For instance, I like all our meats to be grass-fed). That said, we keep our grocery list small, and our expectations low. Here are some of the principles I try to follow. I know prices, and I keep my own price-point list. A price-point list is a list of what I am willing to pay per item. This allows me to shop anywhere, and forces me to be selective. Even if I duck into Trader-Joe’s, I still will not pay over $2 for a box of cereal. I would encourage everyone to create their own price-point list by going to Southern Savers (run by Jenny Martin), and printing off her “Buy-Price List” pdf. Obviously her price-points are extreme (only possible by using coupons!) but they are incredibly helpful as a guide. If you are interested in couponing, I recommend Southern Savers and her workshops which are worth their weight in gold. If you ever want me to post about my experience with couponing, please let me know! I use Southern Savers to create all my shopping lists, whether I use coupons or not. On her website, she keeps current sales lists for every grocery store. For instance, here are her lists for Kroger. I click on the latest list, check off the items I want to buy, and print off the grocery list. These lists are drawn from the grocery fliers, so they guarantee that I will be getting a list of best-priced items. I can add any items I might need, but try to limit myself to items on sale. I know my grocery stores. I always get milk from Kroger. I never get meat from Whole Foods. I always get my baking ingredients from Aldi’s. I buy cinnamon from The Dollar Tree. I shop BOGO sales at Publix. I love Kroger’s MegaCart Sales. You get the idea! I try to make only one grocery run per week. But, I sometimes make two if it keeps everything cheaper. I have a special place in my heart for Whole Foods and Trader Joe’s. I can’t help loving these stores. But, they are often far over my price-point. So, I have a separate mental price-point list for them. If I spend more for my produce there, I will forgo snacks, extra dinner items, and maybe that box of couscous I wanted to try (because I have plenty of rice at home). This mentality keeps things interesting, without indulging too much. I shop the perimeter of the store. I get the most items from the produce, dairy, and meat sections. The aisles are often just “extras”. This keeps me from buying a lot of packaged items. I pretend that grocery shopping is “me” time. 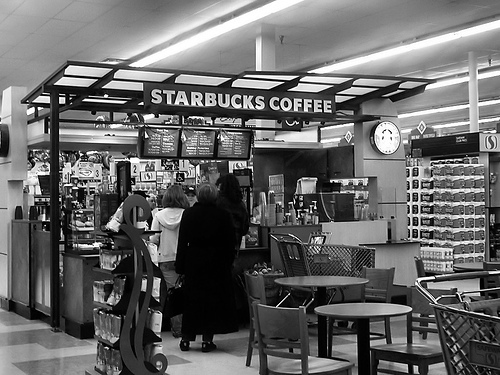 Sometimes I get a cup of Starbucks coffee and wander through the store. For some reason, I really enjoy grocery shopping, and this allows me to go slowly, think about prices, and not rush into buying anything.